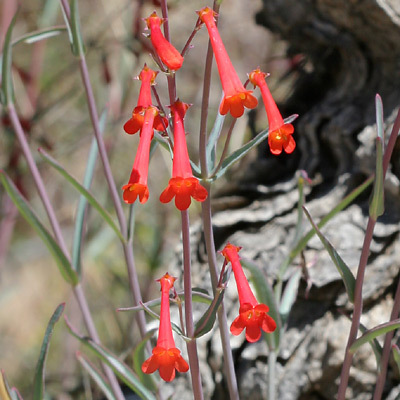 Description: The semi-bilateral, slender, tubular flowers are 1 inch (2.5 cm) long with 5 spreading lobes and stamens that do not project beyond the flowers. The leaves are green or grayish, opposite, and narrowly linear. 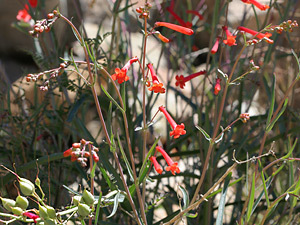 The similar Firecracker Penstemon (Penstemon eatonii) has projecting stamens, broader leaves and flowers, and less spreading flower lobes. Hummingbird Flower – The nectar-filled flowers attract hummingbirds.